Nuts and chocolate do something to me. And, as evidenced by how long these vegan and gluten-free almond butter cups stick around, they do something to my roommates too. I just spent the last week in Nicaragua’s Maderas Village amongst some of the most wonderful food, people, and weather I’ve ever encountered. We stayed up late every night, exchanging stories and admiration for one another. Â We swam in the ocean with phosphorescent water creatures, rode horses on the beach at sunset, and spent an entire day on a catamaran that sailed us to a private beach. We made wonderful new friends, and ate some of the best food I’ve ever grasped in my hungry hands. Breakfast was served from 7:30 am until 4:30 pm (!). We briefly ceased our feasting at 4:30 pm when the kitchen closed to ready itself for the 40-person feast that they served every night. As we sat around two huge special-made wood tables, we were instantly transported back to our high school cafeterias as we sang, drank watermelon margaritas, and were served perfectly-portioned meals from around the world. Although dinners varied, breakfast and lunch consisted of typical Nicaraguan fare. The ingredients and preparation were simple, yet I still long for their fresh avocados and eggs that I ate every morning. Being gluten and dairy-free, I have grown accustomed to solemnly restraining myself when dessert plates are passed around after dinner. Although I was more than satisfied with every meal that Maderas Village served us, the bananas and peanut butter that I ate as my late-night snack inspired me to don my apron in my own kitchen as soon as I returned home. 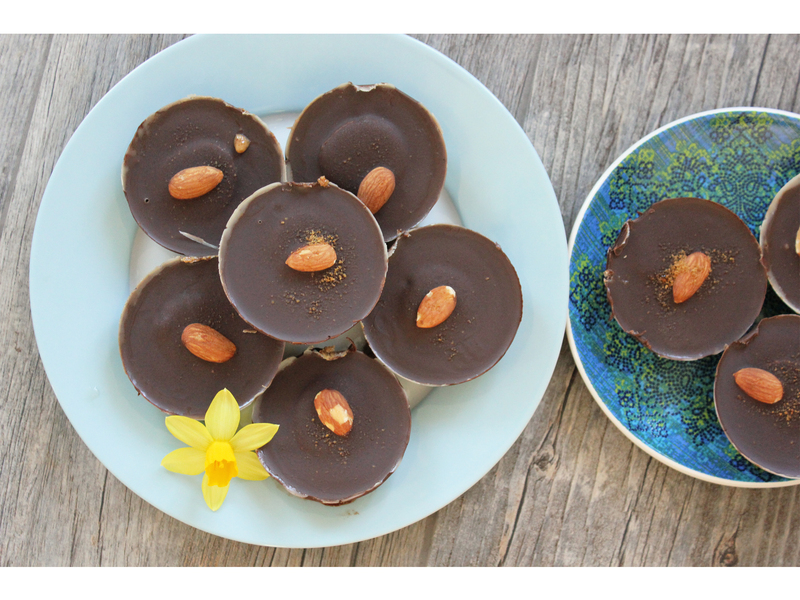 These vegan and gluten-free chocolate almond butter cups were the first and only dessert I wanted to make. They are the answer to all of the years I spent wishing I could still eat Reeses Peanut Butter Cups. They are just sweet enough, a bit salty from the almond butter, and free from processed sugars. They are also far healthier and loaded with rich, clean ingredients that won’t turn you into a ball of allergenic pain. Free of preservatives, they must be kept in the freezer but still remain a perfect consistency should you wish to remove one and eat it immediately – which you will end up doing. Prep a standard-sized muffin tin by generously spraying 10 cups with coconut oil, set aside. Prepare the filling by mixing the almond butter and honey and slicing the banana. In a saucepan over medium-low heat, warm the chocolate, oil, cocoa powder, and salt until the chocolate is melted. Make sure to slowly stir with a spatula so that that it does not burn. 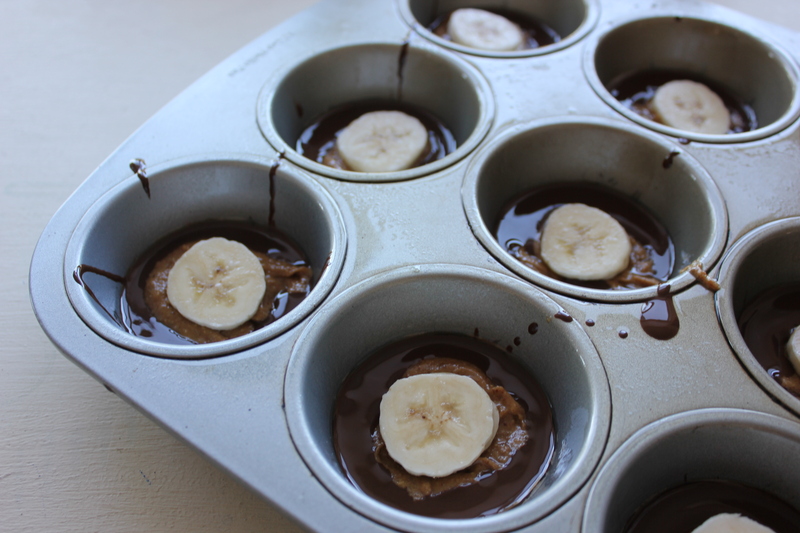 When entirely incorporated, fill each prepared muffin cup with 1 to 1 1/2 spoonfuls of the melted chocolate. Using a fork, scoop about 2 teaspoons of almond butter filling directly in the center of each chocolate-filled tin. Place a banana slice on top of the almond butter. Using the remaining chocolate, cover the filling with 1-2 spoonfuls of chocolate until the filling is no longer visible. If desired, place one almond atop each cup, and sprinkle with a pinch of coconut sugar. To set, place the tin in your freezer for two hours. Then, remove the tin and let sit on the counter for no more than five minutes. Slide the blade of a rounded knife between each chocolate cup and metal tin to pop each cup free. If they do not pop easily, wait a minute or two more. 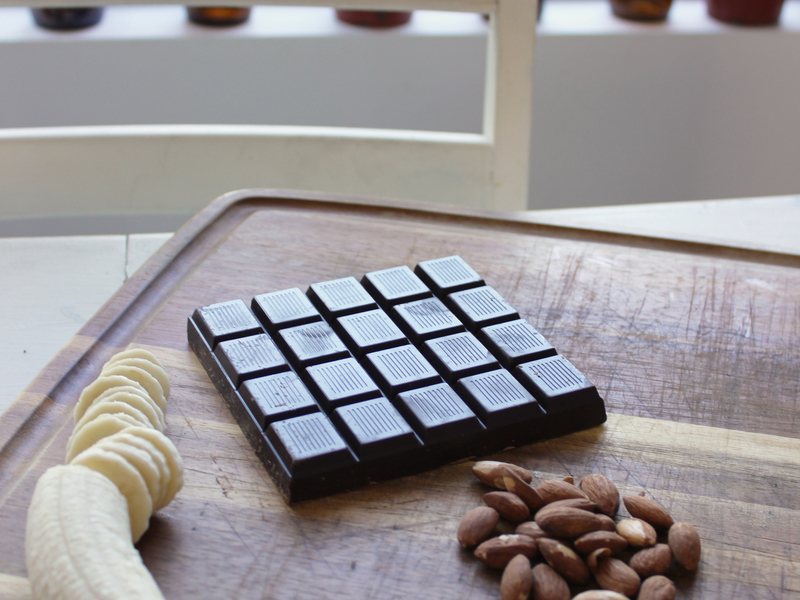 Store the almond butter cups in an airtight container for up to two weeks.